On October 26th, John Abbott’s Astronomy Club hosted a space related Halloween event at the RASC’s Morgan Arboretum observatory. Children and some members donned their Halloween costumes, ready to have a spooky (and candy-filled) pre-Halloween night. In a thank you letter to the club, RASC Montreal’s president, Morrie Portnoff stated that over a hundred came to the evening. Targeted for little children, the event consisted of a series of activities to help the little audience explore the vastness of space. These activities ranged from story-telling of the various Greek gods and goddesses that gave their names to the planets of our Solar System, to a game of pin the Moon on the planet. Children were also invited to create their own constellations with marshmallows and straws, and they could let their imagination run wild by designing their own planet. Also, a very talented member of the club painted many smiling faces with beautiful astronomy-themed face paint. Towards the end of the activities, a surprise visitor appeared–Bill the Alien. He lost his spaceship, and the children were invited to help him find it among the stars. Members from RASC Montreal kindly helped the club by assisting the children in the treasure hunt by showing off their telescopes, how to use them properly and what could be seen. Although clouds had begun to roll in during the evening, some objects, stars and Mars could still be seen. 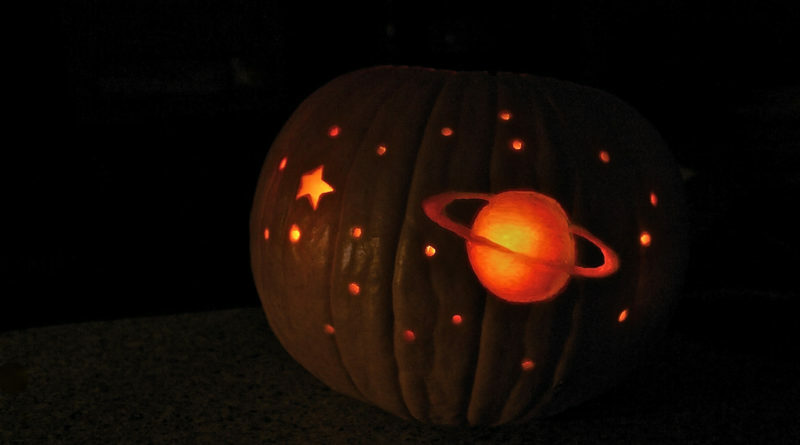 In the end, it was a lovely evening where Halloween and astronomy met.